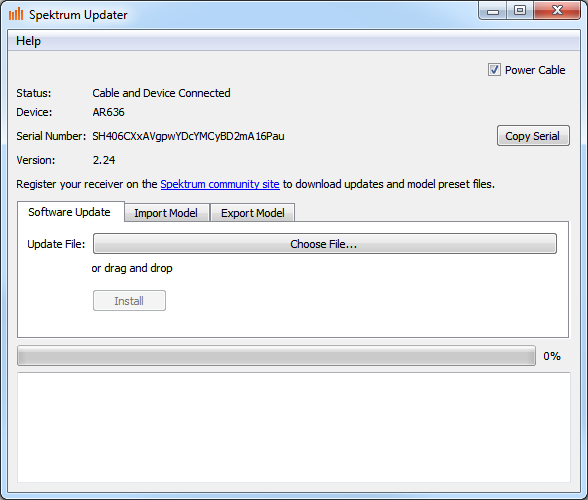 Download Spektrum Updater v1.2.4 and install it. Open Spektrum Updater from the Start Menu or Desktop. Plug the USB programmer cable (SPMA3065) into the computer and plug the cable into the BIND/PROG port of the receiver or the programming port on the transmitter. Power the transmitter or receiver. The serial number of the device should be displayed. Register the receiver on the Spektrum community site. On the community site, click “Download Updates” next to the receiver that you want to update. Click “Updates” under the update to download it. In Spektrum Updater, either click “Choose File…” and choose the downloaded file or drag and drop the downloaded file to the window.